UV2600 is a double beam UV-VIS Spectrophotometer with a big scream and scanning function. New optical system and circuit system make the instrument have: high-resolution, low stray light, lasting stability, high-SNR. This instrument can meet the multi-level analysis application requirements of users. The computer application system of UV-VIS Spectrophotometer can achieve more powerful function for your instrument. 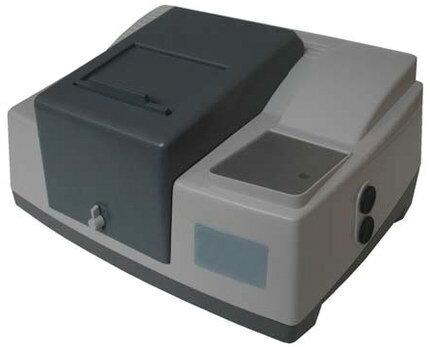 UV2800 is a double beam UV-VIS Spectrophotometer with a big scream and scanning function. New optical system and circuit system make the instrument have: high-resolution, low stray light, lasting stability, high-SNR. This instrument can meet the multi-level analysis application requirements of users. 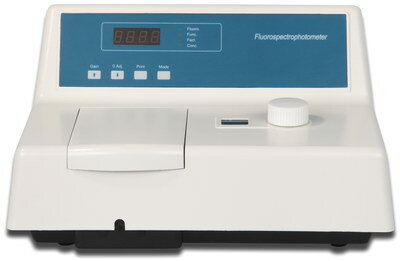 The computer application system of UV-VIS Spectrophotometer can achieve more powerful function for your instrument. -Can be easily replaced light source. -Easily upgraded: Many optional accessories enhance the flexibility and the measurement range of the instrument. 1. 1200 line diffraction grating emission monochromator. Its large aperture and non-spherical reflecting mirrors produces extra high sensitivity. 2. EX light use LED, match with the central wavelength of 365nm, 420nm, 475nm, 525nm narrow banding-ultra low back grounding precision filters to consist 4 set of EX wavelength replacing system. Carry on the maintenance expediently & can satisfy more choices and demand. 3. The central wavelength of 365nm, 420nm, 475nm, 525nm narrow banding-ultra low back grounding precision filters with low fluorescence background. Its performance is better than glass filter. Fluorescence analysis is a high sensitive and high selective sophisticated analytical method. This method can provide information including excitation and emission spectrum, emission light intensity and measurement of life of emission light and polarization fluorescence etc. This method can provide a wide lineal range of working curve. 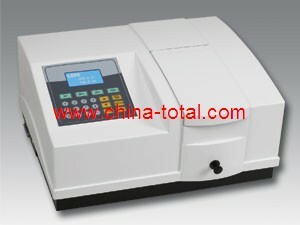 It has becoming an important analytical method in the region of trace analysis. 1. Medical science and clinical analysis Clinical analysis of biological specimen. 2. Pharmaceutical science and pharmacology Analysis of natural pharmaceutical products; Quality control of pharmaceuticals and research of pharmaceutical metabolites. 3. Biochemistry Analysis of minute quantity of substances in biological body. 4. Food industry Analysis of minute quantity of constituents in food. 5. Pollution analysis Atmospheric pollution, environmental testing and food contamination analysis. 6. Organic and inorganic chemistry Used in the trace analysis in case of those substances cannot be determined by absorption spectrophotometry. 1. Two operation modes could be chosen: fluorescence intensity and luminous intensity. Fluorescence scanning, kinetic determination and quantity analysis could be done under fluorescence intensity mode. 2. 365nm exciting wavelength, Raman peak of water S/N≥150 High performance sensitivity simplifies the measurement of low detective sample. 3. 10 stages gain adjustment could be chosen for emission spectrum scanning, including high speed low S/N scanning and precise scanning. Total spectrum scanning could be done in 1 second. With the intelligent pre scanning feature, unknown sample's spectrum information could be detected rapidly. Auto-omission of the influence of scattering peak and harmonic peaks, it ensure the best measurement parameters and locate the fluorescence emission peak. 4. Support off-line mode and on-line mode. Under off-line mode, instrument's computer system offer the fluorescence intensity measurement, concentration direct reading, auto 0 adjustment, auto background subtraction and etc. Under on-line mode, we could use quality and quantity software to control data acquisition and analysis through USB2.0 interface. 5. High stable and long life 150W xenon lamp and power source ensure high stable testing and wide range of spectrum. 6. The normalized feature for fluorescence value could make different fluorescence's result comparable. 7. Provide optional PC qualitative and quantitative software package with expansible time scanning, wavelength scanning, graphic calculation and storage-access abilities. 8. 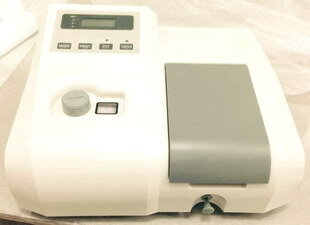 Optional accessories for different measurement, including single hole cell holder, fluorescence sample holder for different features, 200μl micro scale centrifuge tube, micro scale capillary sample holder, semi-auto sample introduction accessories, membrane sample accessories, powder sample accessories, jacket sample accessories and etc. b) An optional interference optical filer of 25mm diameter of wavelength of 250-700 nm can be provided on users demand. SRS7600 is a single-beam FTIR spectrometer. This instrument is operated by a PC with user friendly software and a comprehensive manual. Fast scan speeds, high accuracy and ease with operation are its features. It is an indispensable analysis tool for various application fields such as chemistry, medicine, food and beverage, wine industry, chemical engineering and quality control. ● The design integrates main components to an optical bench machined from a cast aluminum. Highly stable and no need for adjustment, removing troubles of maintenance of optical path. ● The system’s corner cube optics provides easy operation without requiring complicated electronics and additional moving parts. In addition, many components of the spectrometer are user replaceable which saves time over the lifetime of the instrument. ● Internal dynamic collimation system and movable mirror driving system keep the interferometer at optimum situation. Voice-coil driver and precision slide improves the ability of working in severe conditions. ● The spectrometer includes a container of desiccant that protects the beam splitter and other optical components from moisture damage. Standard sample compartment allows many types of accessories to extend the functions of the spectrometer. 1. Build-in computer data processing and LCD: adopting highly integrated micro digital circuit, which is stable and reliable with the functions of integral holding, peak height and area, auto zero adjusting, deuterium lamp and background, multi-linear and nonlinear curves fitting, various parameters and working curves displayed in screen and report printing, etc. It is equipped with interface for externally linking PC. 2. Good basic line stability: Double-beam system of optimized design can automatically compensate the light source drift and wavelength drift caused by the variation of temperature (with the function of the eliminating the affection of wavelength drift on the base line stability) and electronic circuit drift so as to reach a good basic line stability. The cathode lamp needs not be pre-heated for long time and sample can be analyzed immediately. It is the preferable instrument chosen by users to conduct analysis of multiple kinds of elements and fast analysis of samples. 4. Optical path of high energy: A total reflection system is adopted to eliminate color difference in full range. By means of chemical conversion, a round light spot of the light source becomes a long light spot, which enters into the slit. Therefore the light flux of double beam is enhanced. 5. Long-life and anti-corrosive atomization system: The burner is made of new type titanium alloys, anti-corrosive and fast thermal equilibrium. 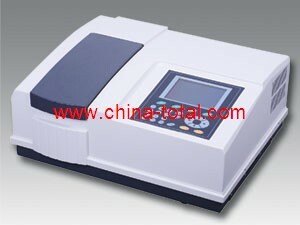 It meets the requirement of measurement sensitivity without water-cooling. 6. Multi-functional analysis mode: for methods of flame absorption, flame emission, graphite furnace atomic absorption (AS-3020 automatic sample feeder can be installed) and hydride generation. 7. Safe and reliable gas path system: Special devices of quick gas conversion and safety protection can be used to analyze air-acetylene flame as well as nitrous oxide-acetylene flame and extend the analytic elements to reach more than 60. 8. Complete set of accessories: to be supplied with the instrument and ready for use after they are purchased. 9. Background calibration ability: Greater than 30 times. Flame atomization system: Inter-changeable titanium alloy burner of 10cm and 5cm slits. Gas path is equipped with pressure indication, high precision voltage stabilizing flow adjustment, fast conversion of air and nitrous oxide, gas supply cut off, power cut off, prevention of flashback and logic interlock protection devices. Signal processing: Build-in microprocessor and LCD. Signal amplifying modes: absorptance, concentration, emission and emission concentration; Standard curves: linear regression, curve fitting and multi-point standard calibration. Average value, standard deviation, relative standard deviation and correlation coefficient can be worked out. Standard curves, atomic absorption peak diagram, spectrum outline sketch, data as well as instrument parameters list and analytical reports can be displayed and printed out. Main accessories supplied with the instrument: Several decades of accessories including air compressor, printer, one piece of (Zn/Cu) and K. Gas external pipe, acetylene cylinder pressure-reducing valve and water knockout gas filter. HGA graphite furnace system: Used to conduct trace and ultra-trace analysis with an absolute sensitivity of 10-10-10-12 gram. 5cm long-life titanium burner: The necessary accessory for nitrous oxide-acetylene flame analysis. Hydride generator (Totally automatic): Making the characteristic concentration of As, Se, Sb, Bi, Pb, Sn, Te, Ge, In, Tl, Cd and Zn lower than ppb level with cold atomic mercury measurement method. Nitrous oxide generator (Totally automatic): The necessary accessory for nitrous oxide-acetylene flame analysis. Hollow cathode lamp: All specifications are available. Graphite tube: All specifications are available. 1. Completely controlled by PC, can flexibly select the flame and graphite furnace atomizer (optional). 2. Integrated floated optical platform design can obviously improve the optical system shock resistance and keep stable though use the optical signal for a long term. 3. Eight light stands can be changed automatically and preheat the eight lights meantime as well as optimize the working condition of the hollow cathode lamp. 4. Position adjusting: the best height of the flame burner and can automatically set the front and rear positions. 5. Fully automated wavelength scanning and peak searching. 6. Complete safety chains protection equipment: the function of warning and automatic safety protection towards the wrong burner, leakage of the gas, under voltage of air and the abnormal flameout. 7. Deuterium lamp and self-absorption background regulation. 8. Data processing: super strong database, possesses more than 500 data self-storage and cut-off storage function, can store the analyzed result with the form of EXCEL and the testing method and the result can be randomly called. 9. Measuring method: flame absorption method and emission method. 10. Result printing: parameter printing, data result printing and diagram printing. * The bringing in of PID technology can effectively overcome the influence on the temperature rising process caused by the voltage fluctuation and the resistance change to make more accurate controlling process. The combination of the 3ms/time fast sampling technique can make more accurate and reliable testing data. * The fast heating capacity can improve the flexibility of the elements further. * Use the ordinary power source of 220V without need of dynamic power of 380V. * The maximum procedure heating capacity setting of 20 levels can make a more convenient and easier test of different samples. * Three grades adjustable gas flow can accustom to more application needs. * Can timely alarm when the gas and water is stopped and insufficient gas and water, can avoid the equipment damage and measuring error. * EPC can control the flow of Acetylene (C2H2) more accurately and it is a kind of system which also can operate easily. * Efficient atomization system enables a higher sensitivity. * The whole operation system has a high security as the fire safety system can alarm whenever the electricity is cut off, abnormal flame occurs, a lack of pressure happens or the burner does not match well. And it will automatically turn off the gas, prohibit temper ing. Thus it keeps the operation people and equipment from harm and damage. * A workstation that is supported WINDOWS XP/2000/NT. * The rich menu brings great convenience to the use of customer. * Convenient conversion between different menus makes the operation more easily. * Various analytical correction methods provide the users more choices. * Basic default parameter settings enable even the beginners can do the normal operation. * Flexible storage, editing and printing methods give the user largest support. Can automatically cut off the gas when the pressure is not enough, the power is off, flameout and unconformity of the burner. Explorer XRF portable series include harmful elements analyzer Explorer 3000 XRF, alloy analyzer Explorer 5000 XRF, mineral analyzer Explorer 7000 XRF, soil heavy-metal analyzer Explorer 9000 XRF. 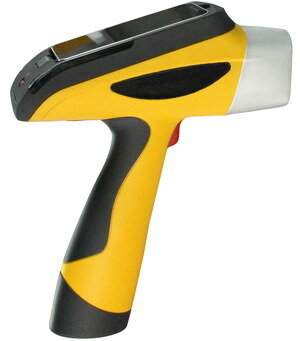 ( XRF -X Ray Fluorescence- refers to X-ray fluorescence analysis). EXPLORER 3000 handheld harmful elements analyzer is specially designed for the RoHS industry. The use of digital multi-channel technology makes the detection limits lower, stability higher and application wider, making its performance as great as the desktop. With small size and light weight, EXPLORER 3000 is portable and convenient for testing. EXPLORER 5000 handheld alloy analyzer is the first to use large-screen, high-resolution LCD and the new digital signal processor. The minimum detection limits make its performance as great as the desktop. 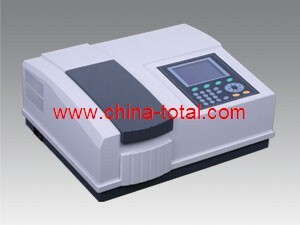 With small size and light weight, EXPLORER is portable for testing and suitable for analyzing different kinds of alloy. EXPLORER 7000 introduces digital multi-channel technology, lower detection limits, better stability, wider application range, and comparable performance with bench top; small and convertible size for all kinds of geological ore prospecting, multi elemental detection and analysis in exploration, refining slag, gives full play to the role of the analysis, makes the prospecting work more simple and easier. EXPLORER 9000 handheld soil heavy metal analyzer is the first to use large-screen, high-resolution LCD and the new digital signal processor. It’s able to carry out in-situ test and repairing analysis for the soil pollutants, effective testing about heavy metals including mercury, cadmium, lead, arsenic, copper, zinc, nickel, cobalt, vanadium, chromium, manganese in polluted soil, and also add testing elements according to clients’ requirements. With small size and light weight, EXPLORER is portable for testing heavy metal in soil, even for low content and its performance is as great as desktop. The new generation of Explorer XRF portable X-ray fluorescence spectrometer series is mainly used for metal materials reliability identification, alloy grades rapid identification, soil heavy-metals field testing and field in situ multi-element analysis for various geological ore, fully meeting the market demand from raw materials testing, process control to field online analysis of various elemental composition in product testing. * The introduction of 3 core technologies, miniature low-power end-window integrated X-ray tube, large area beryllium-window silicon drift detector (SDD) and miniature multi-channel digital signal processor, has significantly saved test time, improved the detection accuracy and reduced the errors, which enables the portable analyzers possess paralleled performance to desktop analyzers. * Measurement can be directly carried out on the sample surface in field analysis, without additional sample preparation, which suits samples of any type, such as electrical and electric products, alloys, geology and mineral resources, soil, rock, residue, small solid particles, and liquid sediment. * The multiple measurement modes to choose from and unlimited number of modes to add at will, together with its automatic matching feature, help achieve easy one-button measurement. Its built-in intensity correction method can correct all deviations from samples of irregular geometric shape and uneven structure and density. * Innovative software interface and core combining EC with FP software has a wider application, with high sensitivity, short test time, easy operation, less restriction for the operator. * Embedded Windows CE system, high resolution LCD touch screen, digital multi-channel technology and SPI data transmission greatly raise the data transmission and data processing ability. Wherever you are, the measurement data is all at your reach. * Triple security: auto-sensing, blank test, two-seconds auto-off X-ray tube with radiation level far below international safety standards, no radiation leakage; thicker protective wall. Protective safety hood. * Two large-capacity 9000mAH lithium batteries can work for 8 hours continuously. Equipped with a wide-voltage AC charger or car-loaded charger ensure test at anytime, anywhere. * Warning indicator system. Powered, the green light is on; testing, the red light flashes to prevent error. * The instrument is of waterproof, dustproof and works continuously in an environment of high temperature and high humidity. Its protective box uses high strength military supplies with good waterproof, shockproof, anti-pressure function. auto-sensing; no sample, no work; max. radiation <5μSv/hr. Powered, the green indicator is on; testing, red radiation warning indicator flashes .